Markets erased early gains in the last half hour of trade as investors scrambled to book profits after last three days of consolidation. Key benchmark stock indices were dragged down by sell-off in heavyweight IT stocks. IT major Infosys crashed 8.5 per cent to 3,357.50 on reports that the management expects sluggish growth in January-March quarter in the current financial year. 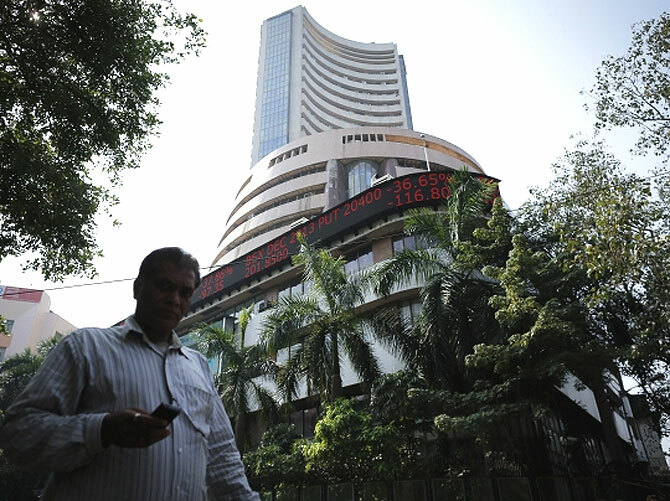 The 30-share Sensex shed 82 points or 0.4% to close at 21,775 levels and the 50-share Nifty was down 24 points or 0.4% at 6,493.10 levels. “Whenever the bullish bias or euphoria in the market swings too far in one direction, index always reverts back to the mean. So in this case, Nifty could revert back to the earlier breakout point of 6330. "Possibilities are that index could begin a process of distribution at higher levels, which means in the short-term upside appears to be restricted,” says Pritesh Mehta –Sr. Technical analyst, IIFL. According to traders, heavyweight banking and oil & gas stocks which balanced the drop in IT stocks saw profit booking in late trades while selling in IT stocks intensified. Private lender HDFC Bank and oil & gas major Reliance Industries, which gained between 1-2%, emerged top heavyweight gainers. HDFC, ITC, ONGC and Coal India were the other top gainers. The Indian rupee firmed up after retail inflation data for February, announced a day earlier post market-hours was better than expectations. The partially convertible rupee was trading at 60.07-a-dollar compared to its previous close of 61.22. The Consumer Price Index fell to a 25-month low in February and is likely to increase the clamour for the Reserve Bank of India to cut interest rates in its next monetary policy. The combined (rural + urban) CPI inflation moderated further to 8.1% during February 2014 as compared to 8.8% in January 2014. Asian markets finished mixed as of the most recent closing prices. The Shanghai Composite gained 1.07%, while the Hang Seng led the Nikkei 225 lower. Nikkei extended losses after witnessing a dip on Wednesday as export-oriented stocks witnessed profit and metal shares edged lower over China concerns. The benchmark Nikkei ended down 0.1%. China witnessed a marked slow-down in the economy in the first two months of 2014, as factory output, growth in investments and retail sales fall to multi-year lows. China's industrial output grew 8.6% yoy in January and February, missing market expectations, while growth in retail sales was lacklustre too, the National Bureau of Statistics said. Retail sales rose 11.8% in the first two months of 2014 compared to the year ago period, the government said. China's Shanghai Composite was up 1%, Hang Seng was down 0.7% and Straits Times was down 0.4%. Reliance Industries pulled the oil and Gas index to the top slot from amongst the BSE sectoral indices; it is up 2.3% followed by Bankex, Auto, metal, consumer durables among others. Meanwhile, IT index was the top loser down 2.8%, as rupee strengthened against the greenback on back on lower inflation. In the banking pack HDFC Bank, SBI, ICICI Bank, HDFC and Axis Bank up 1.3-2.2% each. Banking shares were in demand today as lower-than-expected consumer price inflation for February raised hopes of a policy rate cut by the central bank. M&M, Tata Motors, Bajaj Auto, Hero MotoCorp were among the top gainers in the auto pack up 1-2.5% each. IT major Infosys witnessed selling pressure and was down a whopping 8.5% at Rs 3,358.90 on reports that IT major expects sluggish growth in January-March (Q4FY2014) quarter mainly due to muted spending by clients, especially in the retail sector. Infosys indicated that the company has continued to see weakness in client spending throughout the current quarter ending March 31, 2014 and the company may only be able to meet the lower end of its annual revenue growth guidance. "Following weakened outlook on near-term growth owing to multiple incremental developments, our FY15E Revenue/EPS is lower by 3% / 5%. However, we retain our expectation of gradual recovery at INFO, beyond the near-term blip from multiple challenges. Our target price of Rs 4,000 discounts FY16E EPS by 16x. INFO’s valuation multiple will be at risk in the event of few quarters of continued underperformance to peers, like that in the past," said Motilal Oswal Securities in a report today. Sun Pharmaceutical Industries has dipped nearly 4% after the US Food and Drug Administration has issued an import alert for all products manufactured at its plant at Karkhadi, Gujarat. Jubilant Life Sciences has moved higher by 8% to Rs 153 after the company announced a price increase of 18% for Niacin feed-grade, with immediate effect. In the broader market, the BSE Mid-cap and Small-cap index were up 0.7% each. Market breadth was strong with 1401 gainers and 1268 losers on the BSE. UPA's economic legacy: Good, bad or ugly?